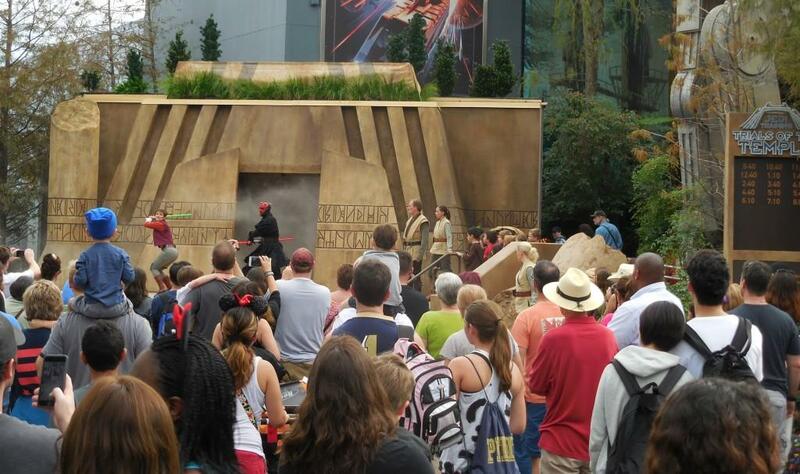 The past few weeks have featured the opening of Star Wars attractions in both Disney’s Disneyland Resort in Southern California and Walt Disney World in Florida. 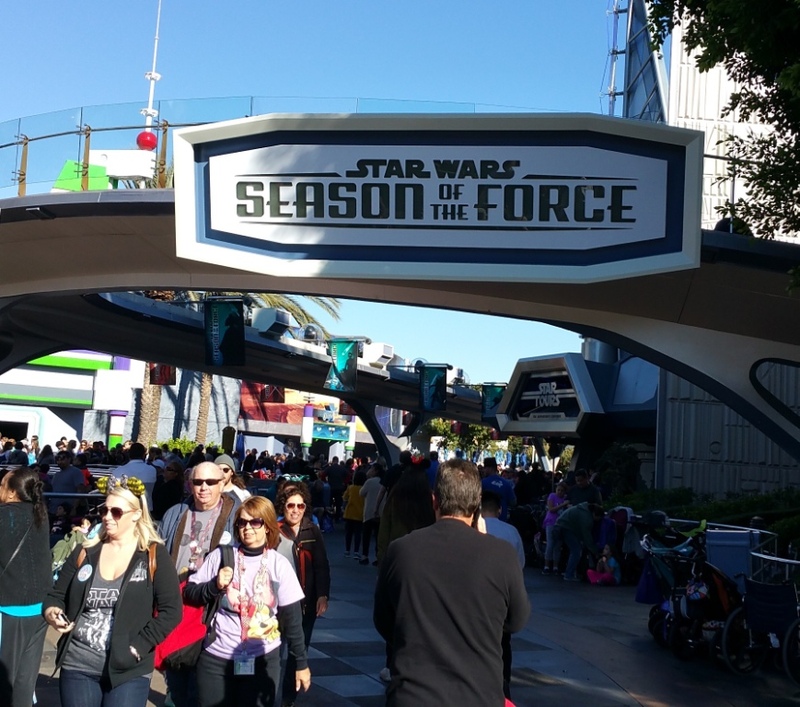 Three weeks ago, at the Disneyland Resort, Disneyland Park opened up their “Season of the Force”, while, on Tuesday in Walt Disney World, Disney’s Hollywood Studios opened up several Star Wars attractions. I had the strangely great fortune to be present on the opening days of each. There are similarities, yet noticeable differences. 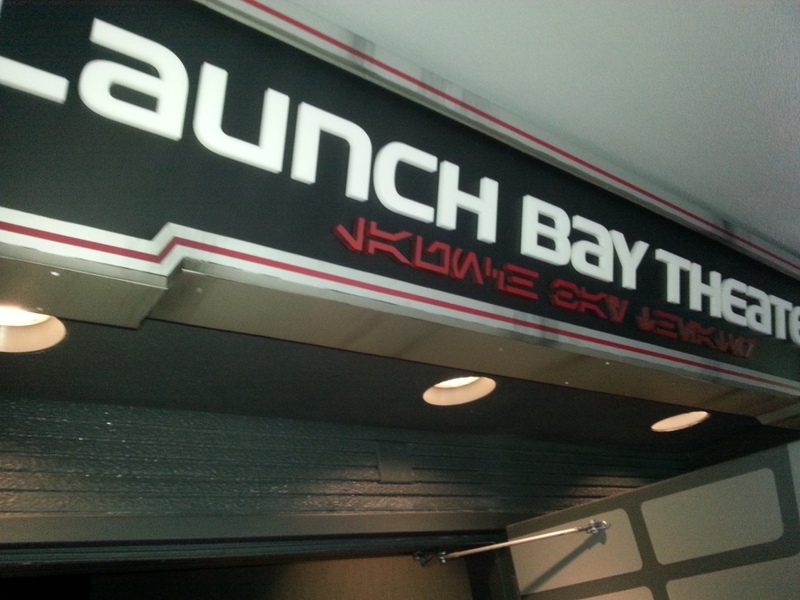 Beginning with their similarities, both have “Star Tours: The Adventures Continue” (which have been around for years, although both of them got a mid-November update with a Jakku scenario), both have “Star Wars: Path of the Jedi”, and both have “Star Wars Launch Bay”. Both of them also have shopping areas where “Star Tours: The Adventures Continue” lets guests out, as well as where “Star Wars Launch Bay” lets guests out. And both of them sell food/drink-related items (e.g. BB-8 drinking mugs, Han Solo in carbonite popcorn containers). For differences, there are many. Beginning with the layout and feel, while the Star Wars attractions at Disney’s Hollywood Studios are spread out in the park, Disneyland Park’s “Season of the Force” is all within Tomorrowland, so there’s a concentration of Star Wars-yness. 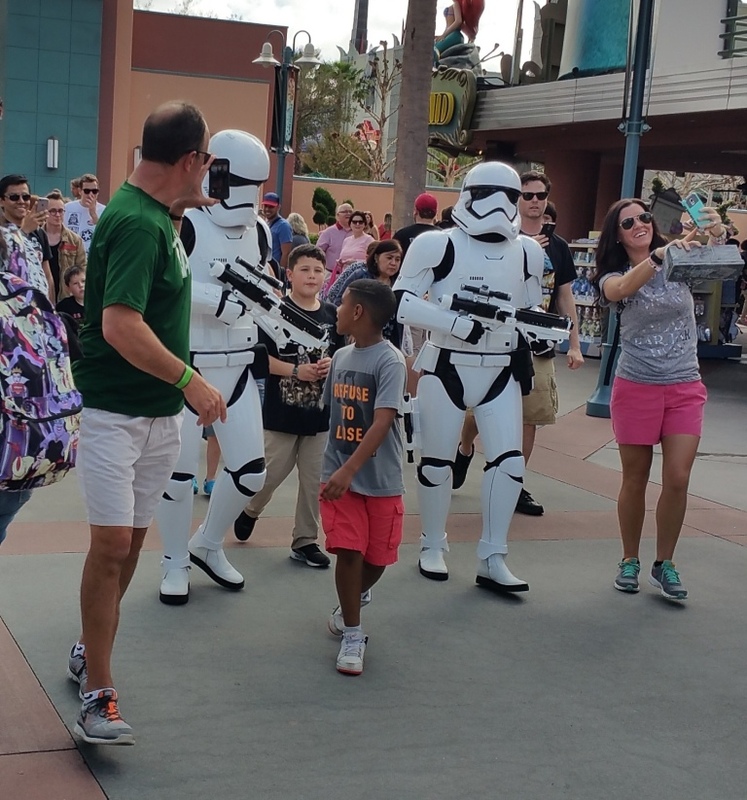 Also at the “Season of the Force”, there is Star Wars music constantly playing, providing an aural Star Wars experience to park guests, which is sorely lacking at Disney’s Hollywood Studios. 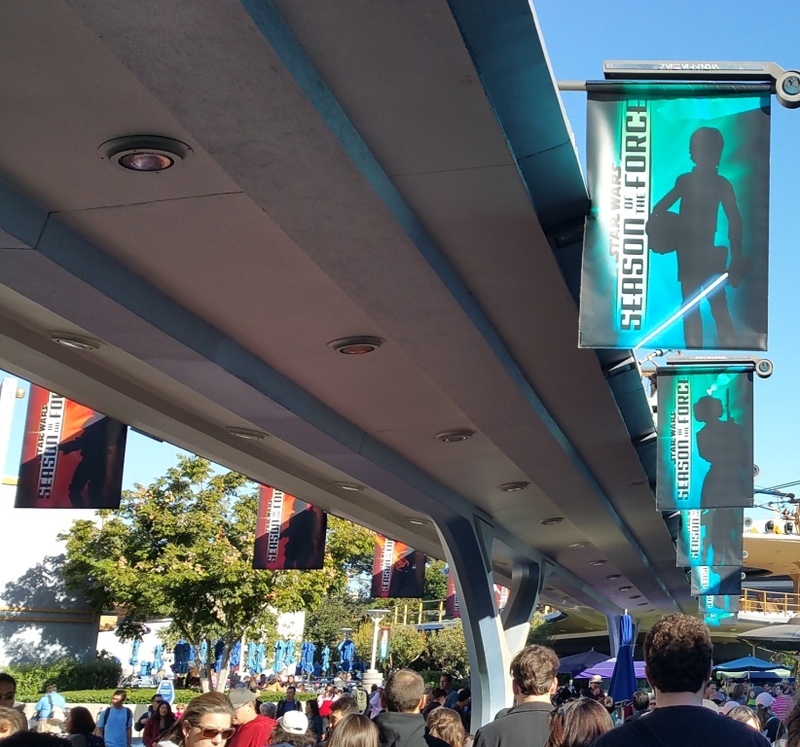 Another way of enhancing the visual experience is that the “Season of the Force” has banners along the tracks of the erstwhile WEDWay People Mover, with “light side” characters along one edge and “dark side” characters along the other. There is an attraction that “Season of the Force” features that Disney’s Hollywood Studios doesn’t have, which is “Hyperspace Mountain”. “Hyperspace Mountain” is “Space Mountain”, albeit a Star Wars-themed version. 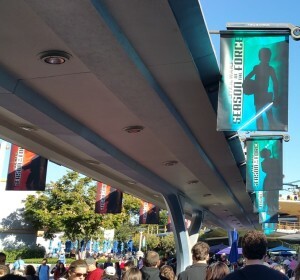 Also, while both of them have “Star Wars: Path of the Jedi”, the experience at “Season of the Force” is better, since the theater which once housed “Captain Eo” has better sound and other features of the experience, while the ABC Sound Studio of Disney’s Hollywood Studio is not set up for that. 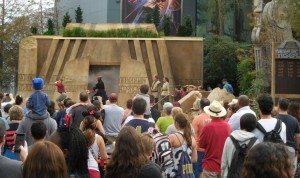 In two ways, Disney’s Hollywood Studios had advantages over “Season of the Force”: 1) they have Watto’s Grotto, which is a spacious shopping area for Star Wars merchandise and apparel, which is neat (albeit pricey), and 2) they have “Trials of the Temple”, in which kids can participate. 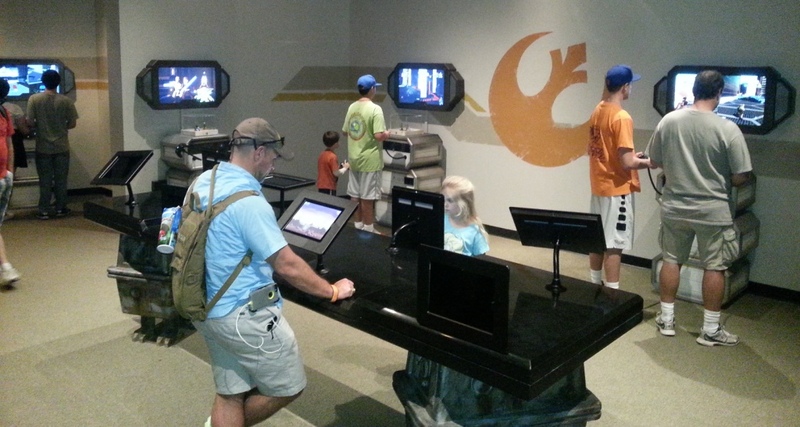 When it comes to the Star Wars Launch Bay, the experiences are somewhat similar, yet quite different. For starters, Disneyland does not have the lovely concept art along the waiting line, as Disney’s Hollywood Studios, which is really nice at the latter. 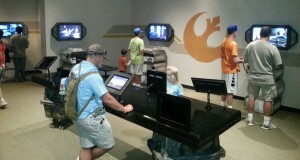 However, it is a stark contrast that, at Disney’s Hollywood Studios, guests have to watch the movie with various Lucasfilm people speaking, while, at “Season of the Force”, not only is it entirely optional, but it’s also presented on a screen that could easily be in one’s house, while the screen at Disney’s Hollywood Studios is a big screen. While I think there is a lot of potential for Walt Disney World’s presentation of their Star Wars attractions, I think that the presentation at Disneyland is significantly better, starting with the closeness of all of its attractions in one concentrated area. Also, the constant Star Wars music accompanied by the banners provide a special touch. 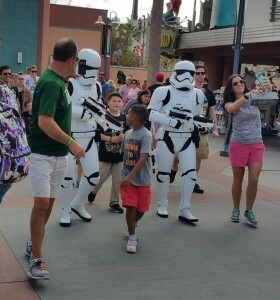 Also, while the amount of people wearing Star Wars shirts was high at both of the parks, it seemed more people came out to Disneyland specifically for the first day of the new Star Wars attractions than did at Walt Disney World. Granted, a lot of that has to do with who travels to which parks and why. 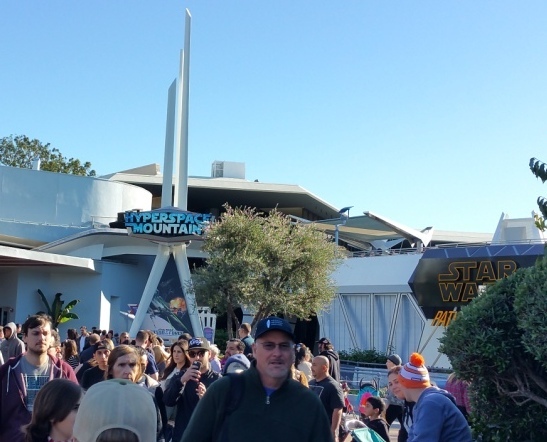 A noticeable difference, though, was that “Star Tours: The Adventures Continue” had a wait time of 10-20 minutes at Disney’s Hollywood Studios, while one would be lucky if the wait was as low as 40 minutes at Disneyland, since it frequently was an hour or more.